Dec - 09 | By: Oregon Film | 4 comments. 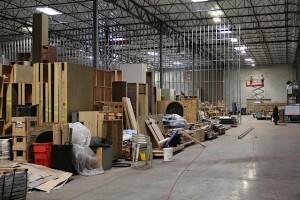 Next year for season 5 of “Leverage,” expect a few changes including a new location for the show’s stages. The truth is the new space is actually an old one that has been frequently used as a stage for several features in the past (“Extraordinary Measures,” “Twilight,” and “Untraceable”). Before this season, the space down in Clackamas was 60,000 square feet of open warehouse space which wasn’t ideal for a TV series. This fall the team at “Leverage” took over the space and are dividing it into three usable production spaces. 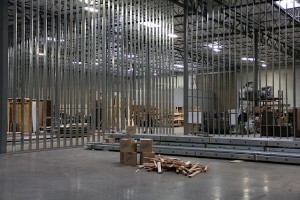 One space will be approximately 12,000 square feet and open up directly into the truck bays. A second 22,000 square foot stage is being created as is a third 20,000+ square foot space that will work as a third stage/construction mill/set storage space. For the past year or so, we’ve been speaking of the benefits of having projects like “Leverage” here in the state as we see longer term investments like this stage improvement. Currently the stage is full of sets and set dressing from the previous three seasons. When I walked through the space with Production Designer Randall Groves, it really hit me just how much money the show has spent in our state so far. By the end of next season, we expect the total number to exceed $100million. More importantly we’ve found a great partner in Dean Devlin and Electric Entertainment, and I expect this partnership to continue for years to come. At this year’s annual meeting we will be showing a new video that Electric Entertainment created showing off the wealth of locations the show has managed to use while here in Oregon. It’s a great video and will be a great recruitment tool in the future. I can’t wait to show it and then put it up on the blog after.